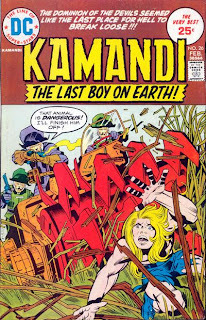 Jack Kirby's "Last Boy on Earth" debuted in his own title, Kamandi #1, November 1972, in which a Great Disaster in the near future had turned an alternate Earth into a wasteland ruled by all types of savage beast-men. After his grandfather was murdered by scavenging rat-men, Kamandi left his protective bunker (called Command D) to search for other intelligent humans in what was left of a destroyed North America. While Great Caesar and his tiger-men governed all the eastern province, monstrous gorillas under Czar Simian controlled most of the west, with Kamandi the strange "talking animal" caught in the middle of their feud. Eventually our hero meets astronaut Ben Boxer, and the faithful dog-faced Dr. Canus, who help Kamandi in his quest to survive capture from the many terrors of this post apocalypse future and try to restore humanity to its once former glory. 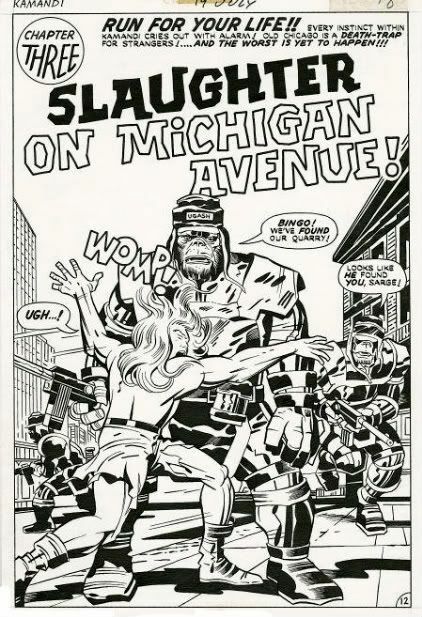 If I'm not mistaken , Mike Royer did the inking for this Kirby series. Yes he did, and Bruce Berry did some of the issues as well, before Kirby left the book.